Created for the Film Industry, combat choreography, professional training for actors, actresses, and stunt men! Military levels designed for the Department of Defense and Department of Justice. Witness China’s Special Forces Imperial Warrior Invincible Assassin with Supernatural Powers and Immortality Forces. Cmdr. Hsu, Fun Yuen of China’s Military Academy privately trains Prof. Joseph Dodaro 20 years in five traditional military systems. Prof. Dodaro continues training an additional 20 years privately under Dr. Hong-Chao Zhang of Wushu to master these military systems. Prof. Dodaro of QI Gong, Taijiquan, and Shaolin is one of the highest ranking military combat specialists with authentic international credentials. Explosive comprehensive elaborate combat assault energy conditioning system eliminate conventional martial arts systems that use punching, kicking, blocking, ground fighting, chokes, and techniques that fatigue muscles quickly. Proven effective 30 yrs by Chicago PD and County Sheriff’s especially by female officers against gangs on Chicago’s dangerous streets. China’s authentic traditional military systems evolved 7000 years ago by Taoist Monks, Generals, Emperors, and Shaolin Monks. Witness by generals on the battlefield in China’s rise to power in the dynasties. Cobra is a code name only for these secretive systems. Cobra Assassination Maneuvers D/L Assassin’s Secrets Level 1 PDF 1,059pp. 800pp combat, 200 pp evolving the invincible assassin, QI Gong for extreme health conditioning on Website bottom right. China is the only system that transforms intrinsic energies creating the supreme level of Combat conditioning simultaneously executing extraordinary health energy conditioning. Watch Traditional Aiki-Jujutsu / Aikido demonstration Zen Priest Shihan Fumio Toyoda and Sensei Joseph Dodaro / Shaolin Tiger and Cobra video classes. kept secret in medical history as the amount of disease it can cure and prevent is astronomical. West Hollywood, Hollywood, and LA Ca. to the Department of Defense & Justice. Film Industry, choreograph combat, Actors, Actresses Stuntmen, and civilians. transformations consistently rejuvenate energetic forces in assassination maneuvers strengthening each intricate human system executing supernatural forces. Assassin’s QI meditative pressurized force explosive strike injects negative energy forces into the enemy destroying organ systems channels. Assassination execution maneuvers quickly paralyze the enemy’s entire body from attacking, or escaping with Chen QI Meditative Pressurize Explosive Force internal strike that is executed simultaneously from the entire body in close quarter combat. Chen explosive force executed from the Dragon Palm or forearm penetrates through the skin of the enemy to the fascia destroying Meridian channels that sends negative energy throughout the enemy’s body to the 78 internal organs, 13 organ systems, nervous systems, and Shen (Mind) shutting down the dynamic biological life force system. Chen simultaneously devastates the peripheral nervous system in all directions that controls the muscles paralyzing the enemy. Assassins assault with Xingyiquan Tiger quickly release King Cobra constricting the enemy from attacking or escaping as deadly pressurized force is quietly executed. Assassins master all eight secret military traditional systems that evolved over 7,000 years by Emperors, Generals, Taoist and Shaolin Monks that condition their entire mind and body creating superhuman pathways. Prof. Dodaro dedicated his life mastering five of China’s traditional military systems that transform health and combat. The Film industry will witness explosive deadly force, quickly and quietly eliminating all conventional martial arts system’s attacks that fatigued muscles instantly and cause injuries. China’s Special Forces assassination execution maneuvers created from five traditional military systems. Military Xingyiquan (Tiger 12 Animals) created by General Yue Fei Song Dynasty 960 to 1279 AD, Military Taijiquan (Dragon) created by General QI Wei Dynasty in 477 AD, Military Shaolin Northern Wei Dynasty in 477 AD by Emperor Xiaowen Military Leader. China’s military systems evolved by Taoist and Shaolin Warrior Monks, Military Generals, Emperors and Military Leaders that witnessed Imperial Warriors on the battlefield’s in China’s rise for power through dynasties. Only China’s Military Systems executes transformations of secretive intrinsic energies developing supernatural powers that prevents and eliminates disease. Assassination maneuvers in six weeks restructure the practitioners dynamic biological life force system, increase and sculpture muscle mass, generate transformation of secretive energies pathways allowing the body to function at maximum force with minimum energy, execute extraordinary explosive force while withstanding excruciating pain. Feel pulsating energetic forces strengthen Shen the unconscious and conscious mind, develop supernatural forces that feels magnificent. Assassination Maneuvers execute explosive devastating force in proximity assassinating the enemy quickly and quietly. China’s five traditional military systems have been proven effective on the battlefield over 7000 yrs. China’s transformations of energies strengthen the intellectual skills igniting the imagination to develop 12 Meridian channels and 8 superficial pathways executing supernatural forces. Assassination maneuvers executes Shen (mind) to transmit electrically signaling through the nervous systems in training that continues 24 hours keeping assassins at a heightened alert level. Shen energy transforms the entire body to maneuver instantly with tremendous devastating force as a tiger attacking its prey. Amazing combat executed no tension or anger. Prof. Dodaro devotes his life to his teachers discovering the secrets of the Universe that enhances citizens throughoutthe world become healthy while simultaneously protecting themselves. Becoming an Assassin is not only about killing, but achieving the highest levels of spiritual energy that can save our nation. Prof. Dodaro in the picture with the Dragon is 60 yrs old in the greatest combat condition without ever taking prescription drugs, steroids, no psychological dependencies or psychoactive substance abuse. Prof. Dodaro at 62 executes astronomical amounts of energy transformations to develop Shen the mind to ignite the imagination to discover a dynamic life force energy. Cmdr. Hsu and Dr. Zhang were amazed over 40 years that an American would have the dedication and patience to accomplish this extremely difficult endeavor that nobody in the world besides the Chinese have even know exists. Prof. Joseph Dodaro Professionally trained Chicago Police and Cook County Sheriff’s 39 yrs, 27 yrs as Master 12 yrs as instructor in Chicago academies. Prof. Dodaro Trained McHenry, DuPage, and Kane County Sheriffs, Corrections Response Team (CRT), plus city Law Enforcement Officers for those counties for 27 years in his Academy. He was a Kane County auxiliary deputy sheriff 1997-2002. Defensive tactical educator for the state of Illinois (N.E.M.R.T.) 2002-2007 created a state approved combat system C.P.R.S. Control Pressurized Force Restraint Submission scoring perfect scores at state training seminars for five years. Created IDS Internal Defense System an antiterrorist system after 911 for the Aviation Industry for Captain Fred Bates head of security for American Airlines and IDS for the TSA Transportation Security Administration to train flight crew to eliminate terrorists in Isle of an aircraft. Cmdr. Hsu, Fun Yuen, China’s Special Forces Certified Joseph Dodaro over 20 years of private training from 1977-1997 to Master of China’s Traditional Military Systems June 30,1991. Cmdr. Hsu personally led 21 Invincible Assassins on several missions high in the mountains into enemy camps canceling enemy soldiers. Prof. Dodaro 40 yrs of private lessons mastered five traditional authentic military systems vital to complete assassination training. Cmdr. Hsu demanded 20 yrs at 20 private lessons per week, then continue an additional 20 years of private lessons with Dr. Hong Chao Zhang of Wushu.Professor spent 37 hours of classes and private lessons with Zen Priest Fumio Toyoda 27 years during that time. Cmdr. Hsu accepted Prof. Dodaro at 22 yrs old as his disciple to pass down the greatest military system in the world before he retired. The disciple experienced most amazing transformations of energies that controlled Shen (mind) developing his body scientifically internally and externally, addictively demanding his time. Energetic spiritual forces invade Shen, nature enters Jing, and QI explodes dynamic life force. Dr. Hong Chao Zhang of Wushu advanced Prof. Joseph Dodaro over 20 yrs of private training from 1996-2016 to Professor of Military QI Gong March 6, 2015, Professor of Military Taijiquan Oct. 8, 2014, and Professor of Military Shaolin on Feb. 8, 2015. Dr. Zhang a government educator is one of the five founders of QI Gong Research Association at Wuhan and Shanghai Institute of Physical Education where he holds Bachelors and Graduate Degrees in Gong Fu. Wushu is a classification of China’s Traditional Military systems over 7,000 years continuously researched by Generals, Shaolin Monks at government research centers. Shaolin Monks, Secret Family clans, and Government educators transfer knowledge to Dr. Zhang to train Professors at universities of China. Cmdr. Koichi Tohei of Japan’s Imperial Army, Founder of Shin Shin Toitsu Aikido, and KI NO Kenkyukai trained Joseph Dodaro 1974-2001 to Sandan (third degree black belt) in KI Aikido / Military Aiki-Jujutsu July 24, 1987, Shoden fourth advanced level of KI Development August 25, 1986, and Associate Lecturer September 16, 1995. Master level of Kiatsu. Sensei Dodaro is authentically internationally register at Aikikiai Hombu Dojo Japan. Zen Priest Shihan Fumio Toyoda Uchideshi under Doshu Kisshomaru Ueshiba Aikikiai Hombu Dojo Japan trained Joseph Dodaro 1974-2001 to Yodan, Sensei in Aikido / Military Aiki-Jujutsu May 18, 1998. Over 27 years 1974 to 2001 Japanese Military Police Traditional Aiki-Jujutsu and Aikido, Qinna joint locks, quick takedowns constrictions, knife, sword, and staff combat. Sensei Dodaro is internationally register at Aikikiai Hombu Dojo Japan. 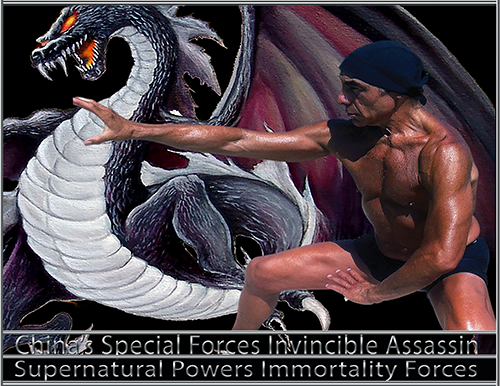 Evolving invincible assassin’s supernatural powers and immortality forces reveals the secret treasures of the Universe. Tigers engage in the assault striking the prey with their forelimbs close to their body protecting their internal organs and claws. Tigers explosive force paralyzes the prey’s entire body, then the claws open ripping through the body crushing the prey to the ground. The ferocious roar transforms energies igniting acupuncture points as killer instincts bites the neck of prey. Xingyiquan Ferocious Tiger’s traditional Chinese system designs a long powerful routine that develops each small intricate section of the body with massive force and maneuver like the Tiger. Assassination maneuvers break down this magnificence routine by beginning to strengthen muscular and skeleton systems to withstand excruciating pain. The picture above is Prof. Dodaro at 60 yrs old in a Tiger stance that he would hold 30 to 60 seconds then explode forward changing legs. In bone physiology placing QI meditative pressurize force on the bone increases marrow density strengthening the bone and simultaneously increases as cultures muscle mass. QI penetrates Shen (Mind) to execute electrically signaling energetic forces from the cranial nervous system into the central nervous system that ignites acupuncture energy field points pulsating energy into the peripheral nervous system that shapes the muscle, fascia, energizes Meridian channels and strengthens the bone. The endocrine system secretes a powerful hormone into the bloodstream executing animal killer instinct and behavior. QI meditative pressurized breathing and a powerful electrically signaling from the endocrine glands transforms energy through 13 organ systems affecting the dynamic logical life force system to function at maximum force minimum energy. Jing energy is extracted from the earth through the Yongquan acupuncture energy field point in the ball of the foot travels to the kidneys to create essence needed for bone marrow. The Yintang acupuncture energy field point in the middle of the forehead connects with the spiritual world energizing Shen energy sleeps in the heart. QI dynamic life force energy in the middle of the sternum connects to the liver and spleen. Shen, Jing, and QI are the three secret treasures execute transformations in the microcosmic orbit of energy. QI meditative pressurized force Tiger breathing places extreme amounts of pressurized force on the entire body transforming energetic energies to execute Chen explosive force. Tiger assassination execution maneuvers consistently executes extreme force from the entire body simultaneously. Tiger routines move the body instinctively as every action creates force. Assassination maneuvers strengthen the entire body to withstand excruciating pain from incoming strikes and continue to destroy the enemies attacking limbs. Once assassins make contact never withdrawal as they are best in proximity. Assassins move instinctively and consistently re-energize their force eliminating fatigue. Assassins conditioning is extraordinary generating tremendous amounts of stamina and endurance as maneuvers execute tremendous amounts of different combat at full executed force from difference heights, speeds, power and force. Chicago PD Female officers excel tremendously on the dangerous streets against professional gangs executing a Tiger King Cobra combination with explosive force. Over 800 pages of combat in Cobra’s Assassins PDF on website and demonstrations on YouTube of Aiki-Jujutsu / Aikido and Tiger. China’s traditional authentic military systems began 7,000 years ago with the discovery of QI Gong, acupuncture, five elements, QI pressurize force breathing, Jing, Shen, and QI the three secret treasure energies. Cmdr. Hsu, Fun Yuen of China’s military Academy training all soldiers, his greatest achievements Imperial Warrior Invincible Assassins. Each mission required specialized training because of the terrain, climbing mountains to get into enemy camps and the urgency to end the war demanded extraordinary conditioning. Assassinations must be fast, quiet, and avoid injuries especially to the legs. Assassins climbed up the mountains using a Dragon stance as two assassins kept their backs to each other to view a 360° circumference. Dragon used the cross leg maneuver that kept them low to the ground appearing like animals to the enemy guards. Dragon executes firearms and daggers magnificently as the forearms close to the body in low stances made them difficult targets and they could pivot 360° quickly and accurately with very small movements. Cmdr. Hsu trained his disciple in five traditional military systems executing assassination maneuvers for each system and five animal styles with its own combat energy conditioning maneuvers. Xingyiquan Ferocious Tiger most powerful entrance demanding tremendous force in punishment drills hold a position 30 to 60 seconds then explode changing legs to the opposite side. There are five assassination maneuvers that take over an hour of excruciating pain. Training was four to five hours four days a week plus Shaolin training with his son Master Hsu, Yumin. Sequences were secretive as combinations of the five traditional military systems executed astronomical amounts of energies. China keeps everything secretive as the powerful force is executed secretive transformations of energies takes years to develop. Prof. Dodaro over 40 years private training has recently mastered five military systems when he received three professor levels from Dr. Zhang. Each session with his teachers 4 hours, today he spends 3 hours QI Gong Dragon, 2 hours Dragon Taijiquan, 2 hours weapons, 1 hours Xingyiquan and Tongbeiquan. Realization is Prof. Dodaro earned his credentials, knowledge, wisdom in the old school. Cmdr. Hsu said that only one soldier out of 1,000 becomes an assassin. Prof. Dodaro trained the longest with Cmdr. Hsu and has the ability to pass this tradition down. Assassination Maneuvers affect mind and body simultaneously, transformation of extreme combat and enhanced health. The most dangerous enemy we face in our life is our own mind that can take you to live in paradise or your worst nightmare. Shen (Mind) is the control center for the transformations of energies, 13 organ systems, 78 organs, 12 Meridian channels, 400 acupuncture points and eight superficial channels. Shen controls emotions that directly affect your health so it is vital to maintain an energy system that supplies Shen efficient nourishment to keep the body functioning at a superior level. Shen (Brain) can’t store blood, oxygen, and glucose as it is extremely necessary to execute a professional energy system as QI Gong and Taijiquan to maintain enhanced health. China discovered 7,000 years ago how to create supernatural forces to help mankind live a long healthy life style. China’s traditional systems are activated consistently in daily routines that are a necessity to enjoy a quality life. When the mind is healthy it makes correct decision spontaneously that they save their life. Shen and Jing control sexual energy that keeps couples happy together that transfers happiness to the children. Shen is responsible to prevent psychoactive substance abuse and psychological dependencies that is destroying our world rapidly and no solution except QI Gong and Taijiquan. Transformations of secretive treasure energies feel magnificent, move the body with full force, prevents depression and fatigue, and increase sexual energy to astronomical levels. This level of QI Gong and Taijiquan can only be produced effectively from Dr. Zhang, Prof. Dodaro, and professors and doctors in China. Aging can be disastrous if you lose mobility and suffer any injuries or prolonged prescription drugs that never cure people only trying to keep them functioning normally. Getting old can be extremely painful with any type of arthritis, rheumatism combinations or several illness that can be crippling. China’s military systems can be used individually for civilians to have enhanced health and protect themselves. The human body needs a minimum of one hour day of professional training. Many fitness workouts are not designed for older or out of shape people, fitness fatigues muscles easily, and has no great effects for the future. Weight training is vital for your whole life, but doesn’t provide a complete system. QI Gong is the highest system research Harvard University Medical School as the greatest secret in medical history as the disease it can cure or prevent is astronomical. Today unfortunately over 87% of Americans have self proclaimed themselves to master and inventive their own system that can destroy your health. Military QI Gong evolved in the 26th century B.C. at Taotang Shi, Tribal Society by Taoist Monks requested by China’s government to help the population become healthy and defend themselves. Prof. Dodaro trains 3 hours daily in the most incredible QI meditative pressurized force breathing system that enhances the smallest intricate movements to create energy force. Discover Shen, Jing, and QI, the three secret treasure energies in the transformation of the microcosmic orbit. Each movement generates the greatest health by transforming energy through 78 internal organs 12 Meridian channels, eight superficial channels, and 13 organ systems to nourish mind and body. Military secretive QI Gong is the foundation for all China’s traditional military systems. QI Gong over 7000 yrs has provided practitioners with extraordinary health, explosive combat skills, incredible intellectual skills, and an energetic feeling that personifies a brilliance young appearance and magnificence health. Each movement energizes the entire mind and body simultaneously that specifically targets a particular organ and organ system to function at maximum efficiency. Amazing QI Gong and Taijiquan are replacing physical therapy and incredible results by psychiatrists in healing depression and psychological dependencies. QI Gong is the highest level in the world to control the mind (Shen) and prevent disease. Military Dragon Taijiquan execute QI Meditative pressurized force breathing strengthening internal external structures developing supernatural forces to prevent and cure disease. QI Gong over 7,000 yrs circulates rich oxygenated blood by a strong pulsating force of the heart to open veins and arteries allowing internal organs to function at maximum force minimum energy. Each intricate movement is strategically, scientifically, and ingeniously in a specific chronological order over thousands of years to move the intrinsic energies throughout the body. Xingyiquan Tiger and Chen Taijiquan Dragon place enormous amounts of pressure on the extremities in low maneuvers that increase bone marrow (ossification) and muscle mass ( hypertrophy), simultaneously the endocrine system secretes a special hormone into the bloodstream for greater development, executing a powerful electrically signaling longer than the nervous system, and generating incredible energy force. QI Dynamic life force energy nourishes our internal organs eliminating depression and stress. Shen enhances sensory neurons that entered the cranial nervous system providing amazing energy to mind (Shen) that ignites acupuncture energy field points as this force moves into the central nervous system through axon fibers. The central nervous system erupts motor neurons that explode into the peripheral nervous system entering fascia executing Meridian channels and superficial channels nourishing muscle and bone. Assassination Maneuvers as Dragon, Cobra, Tiger, Panther, Eagle, Gorilla, & Orangutan develop the body and mind specifically to move exactly like these animals. Similar to athletes that developed their body to respond to the position. Football lineman short twitch muscles, receiver fast twitch muscles, the running back is the assassin moves instinctively all directions. five founders of QI Gong Research Association at Wuhan and Shanghai Institute of Physical Education where he holds Bachelors and Graduate Degrees in Gong Fu. Dr. Zhang has advanced Prof. Dodaro to Professor of QI Gong, Taijiquan and Shaolin that allows him to teach at universities throughout the world. Prof. Dodaro has been educated by Dr. Zhang privately over 20 years in the highest level of QI Gong, Taijiquan, and Shaolin as the military and government have the greatest secretive systems that are never shown to civilians. China executes acupuncture energy field points to move energy quickly and efficiently nourishing the internal organ system. Internal development is vital to connect spiritual energy with mankind and to execute the transformations of secretive energies for exploding force. Prof. Dodaro was fortunate to train under Dr. Zhang and Cmdr. Hsu and receive authentic international credentials of the highest unique systems in the world. Cmdr. Hsu began training Prof. Dodaro at 22 and was the first time he trained a civilian privately in China’s Special Forces assassination maneuvers to present it to the Department of Defense and the Department of Justice. Cmdr. Hsu has designed different levels for each profession as the United States military special forces training in the assassination maneuvers. Law enforcement a specific level, the film industry including actors, actresses and stuntman a specialized level. Prof. Dodaro trains each profession to the highest degree enhancing the intellectual skills, and designs a program that best fits their special needs. Exploding Force. The Laogong Acupuncture energy point in the middle of the palm of hand is directly connected to the heart channel and explodes devastating pressurized force eliminating the enemy. The Yongquan acupuncture point in the middle of the soul of the foot extracts Jing energy from the earth that travels up the Meridian thrusting channels to the Qihai Dantian acupuncture field just below the navel. Jing vitality sexual energy transforms in the kidneys creating essence developing bone marrow that creates red and white blood cells. Kidney essence produces marrow that fills the spine, bone marrow, and spinal cord. Essence is the aspect of the body that creates growth development and sexuality. Jing strengthens the skeleton system that is vital to protect the internal organs and withstand excruciating pain. Chinese military authentic traditional systems execute QI Meditated Pressurized Breathing that consistently places tremendous pressure on the skeleton structure increasing bone marrow density and muscle cell mass generating devastating exploding force. Assassination transformations of the three treasure energies explode the fourth secret energy Chen destroying force executed with the fire Dragon explosive claw that kills instantly. Shaolin Tiger, Dragon, Cobra, Panther, Eagle, Crane, Orangutan, and Gorilla sculpture the assassin’s body to maneuver instinctively energizing the mind (Shen) to develop animal spirituality, behavior, and killer instincts. Each animal system executes extraordinary QI meditative pressurized force breathing that escalates the circulation of the transformations of secretive energies. Assassins imitate the animals as you can clearly witness the powerful consistent flow of explosive energy force. Amazingly the assassination animal maneuvers generates QI Gong to strengthen electrically signaling that executes extreme impulsive energy surges opening pathways developing supernatural powers. Shen’s powerful energetic signaling demands the smallest intricate maneuvers to precisely execute maximum force at various speeds. Yin Yang intrinsic energy force simultaneously attacks in eight Baguazhang directional assault. Each animal system sculptures muscles internally from the peripheral nervous system, endocrine system, Meridian channels through the fascia where Yin Yang intrinsic energy executes a circling spiral force. This is the first offensive attacking energy simultaneously protects the outer and inner surfaces of the body. Yin Yang disperses rapidly to form a shield protecting the assassin as it executes a deadly force that destroys the enemies peripheral nervous system shutting down the defense and attacking 13 organ systems. This incredible assassination is created in the mind in QI Gong. Dedication and patiences is vital to train in an extensive comprehensive elaborate system that will take a lifetime. Special Forces soldiers realize the journey to become an invincible assassin has astronomical benefits in each training session as they feel energetic forces conditioner mind and body consistently feeling magnificence! Xingyiquan Tiger directs tremendous amount of QI pressurized force throughout the entire body to strengthen muscular and skeletal systems. Tigers withstand excruciating pain in low crouching Tiger stances for extreme development to engage in the assault instantly executing maximum exploding force. Tigers attack with their forelimbs close the body protecting internal organs and only released claws after they control their prey. Same reason assassins never punch. Fire Dragon is the largest powerful Dragon that can instantly change into five different animals quickly changing for various attacks. Dragon assaults the devastating force of the Tiger, on contact quickly becomes the King Cobra constricting the enemy from escape or counterattack, quietly executing deadly force. Assassins master all of the animal systems and instantly can switch styles or combine them consistently confusing the enemy. Dragon executes low powerful twisting cross leg maneuvers that is extraordinary for firearms or knives. Assassination execution maneuvers are extremely demanding mentally and physically, in six weeks, witness the most exhilarating amazing physical development and abundance of energetic forces executes intrinsic energies to feel magnificence. China’s military systems are Spiritual Life Energetic Forces that allow assassins to experience secrets of the universe executing longevity. Assassins ignite their imagination discovering new pathways to strengthen their body. Stuntmen. His greatest endeavor would be to create seven male and female assassins that executes explosive choreography combat for film and train them in a reality show, extremely excited. Assassination Maneuvers execute an amazing level of skills and tremendous exploding force. Nobody in the world has been able to witness this fatal system and would be intrigued watching an actual trained assassin by the commander of China’s special forces assassins. Cmdr. Hsu led 21 assassins executing professional guerrilla warfare on several dangerous missions to end the Sino Japanese war. The training over 20 years was inspiring as the energetic levels become greater each year as there is no end to proficiency. Assassination maneuvers are extraordinary secretive because there’s no techniques and the explosive force comes from the transformation of secretive energies. Assassins train hours daily in solitary executing creativity sparking the imagination to feel amazing devastating force. Shen controls emotions that destroys internal organs as anger damages the liver. Positive energy destroys negative energy. Prof. Dodaro, trains individual or group at their facility or special arrangements can be made to rent space. Go to website https://22nddragonassassin.com Cobra Assassination Maneuvers D/L Assassin’s Secrets Level 1 PDF 1,059pp. bottom right. Choose a Military system QI Gong / Chen or Yang Taijiquan / Tongbeiquan / Xingyiquan / Shaolin Quan-Fa / Dragon / Tiger / Cobra / Panther / Eagle / Crane / Gorilla. Contact Prof. Dodaro he would enjoy specializing a system for you or your organization. Choose from over 800 pages of combat or professor will design something special for you. Majority of students at his school for 30 years enjoyed Chen and Yang Taijiquan the most. Professor can demonstrate different systems and have you tried them before you make the decision. You have the ability to change or study more than one system at the time depending upon how often training is. Please keep in mind you will not see this level of expertise in martial arts schools and unfortunately most instructors self-proclaimed themselves to master and make up their own systems. Professor only trains practitioners in traditional authentic systems. Everyone fantasizes to become an assassin. View the videos on website in the online store, Youtube Video Classes, Aiki-Jujutsu Demonstration with Zen Priest Fumio Toyoda, and open eyes to a new world. Prof. Dodaro was the only disciple for Cmdr. Hsu, Fun Yuen that authentically can train professionals in this elaborate comprehensive system. This isn’t a martial arts system or a mixture of systems, but is five of China’s traditional authentic secretive military systems. Professor Dodaro is the only non-Chinese that authentically has an academic ranking of Professor of QI Gong, Professor of Taijiquan, and Professor of Shaolin under Dr. Hong-Chao Zhang. Master of Taijiquan, Tongbeiquan, and Xingyiquan under Cmdr. Hsu, Fun Yuen. Prof. Dodaro has trained thousands of practitioners over 30 years in the professional field trained law enforcement force agencies and over 200 students monthly in his 8000 ft.²’s Academy he owned in Chicago. Doctors consistently send patients to him with illnesses of depression, stress, cerebral palsy, arthritis, rheumatism, addictions, psychological dependencies and psychoactive substance abuse. Professor has helped practitioners lose weight, become healthier mentally and physically, and under the guidance of their Physician lower high blood pressure and decrease the amount of medication through their Doctor. In today’s high technological society mankind is suffering tremendously as health statistics are alarming. Over 60% of Americans take more than one prescription drug. The United States used $374 billion in prescription drugs 2014, 70% of deaths is preventable, 75% overweight and 40% obese, 80% have experienced depression, 25 million Americans are addicted to drugs and alcohol. QI Gong is clinically proven to strengthen Shen Psych to prevent and eliminate psychological dependencies, psychoactive substance abuse, depression, excessive eating, and greatly improve sexual activity. Evolving China’s invincible assassin is not to assassinate people, but to transform mankind to love themselves, their families, and experience a healthy quality lifestyle that passes on from generation to generation. Simultaneously arm Americans to defend against the greatest threat our country faces our minds that can allow us to live in paradise or worst nightmare. Self-defense is not about defending against an adversary, but defending against our own mind devastating our body. Psychology investigation is discovering QI Gong, Taijiquan, and therapy have a greater impact in recovery from stress and depression then medication with no side effects.